Hastily jumping into an activity, job, or something else can cause problems; sometimes a more consistent approach, even if it is slower, can be ideal and give better results. Example: I wanted to get into shape, so I went to the gym and worked out real hard. However, I overdid things because the next day I was so sore that I could hardly move a muscle. Once my body recovers, I plan on going back to the gym, but I’ll start by doing less strenuous exercises and slowly work my way up from there—slow and steady wins the race. As the saying goes, slow and steady wins the race, but where does this term come from? The origin is believed to be from one of Aesop’s fables. Aesop was a Greek fabulist, and it’s believed that he lived around the time of 620 to 560 B.C.E. He wrote numerous fables that are known collectively as Aesop’s Fables. One of the stories credited to his name is one that you’ve probably heard before—The Tortoise and the Hare. In this story, a hare makes fun of a tortoise for being slow. The tortoise then challenges the hare to a race. Amused by the idea, the hare accepts, believing there is no way he could possibly lose to a sluggish turtle. With the course set and ready to go, the race begins and the hare quickly darts down the path, leaving his fellow green contender in the dust. It’s not long before the hare builds a strong lead. Being so far ahead, he believes that the tortoise will never catch up. In fact, the hare feels so confident of the lead he has that he decides to take a nap! Meanwhile, the tortoise continues plodding along, running at a slow and steady pace until he eventually catches up and even passes the napping hare. 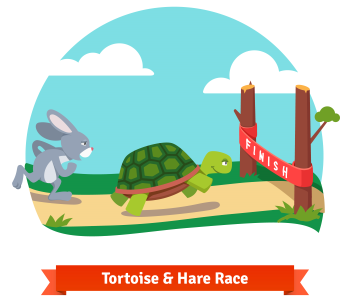 Shortly after, the hare wakes up only to see the tortoise moments away from finishing the race. He desperately tries to catch up by running as fast as he can, but it’s too late, the tortoise crosses the finish line and wins the whole thing. That’s pretty much the story. The tortoise ran all the way to the finish, and even though he was slow, he was persistent. Thus, it’s believed that the moral of the story is ‘slow and steady wins the race’ and that this is where the phrase comes from. A change in my diet was needed if I wanted to be healthier but I didn’t want to alter everything I ate all at once, so I started off by changing one thing at a time. Slow and steady wins the race. Note: Looking for more idioms? Well, Know Your Phrase has a bunch of them, so feel free to explore this site and see if you can find the one you’re looking for. If you want to simply read the meaning for hundreds of phrases, then just select a letter from the menu up top.